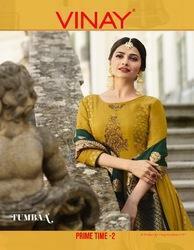 Manufacturer of a wide range of products which include tumbaa prime time vol 2 by vinay, long anarkali suit, designer anarkali straight suits, embroidered anarkali suit, anarkali salwar kameez and anarkali salwar suits. 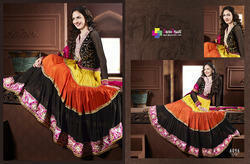 Owing to our experience and knowledge of this domain, we offer the best quality of Long Anarkali Suit. Available with us in various colors, patterns and sizes, the offered anarkali suits are valued for their colorfastness, trendy design, smooth texture and contemporary appearance. The offered designer semi stitched long anarkali suit is highly demanded. Keeping the track of last trends in fashion industry, we manufacture, supply and export the best quality of Designer Anarkali Straight Suits. Ideal of special occasions such as marriage, the offered designer anarkali straight suits are known for their contemporary design. With the aid of our large designing capacity, we have been able to manage the bulk demands of designer anarkali straight suits. By keeping track with the most recent fashion trends, we are bringing forward an eye-catching range of Embroidered Anarkali Suit in wide-ranging colors, patterns, designs and prints. Our offered suit is marvelously designed by our artistic professionals with the use of soft fabric and contemporary techniques. The provided suit is checked on measures of quality constraints to make assured its excellency at our patrons’ end. Apart from this, our clients can avail this suit from us at a budget friendly price. Exporting and manufacturing Ladies Suits that includes, heavy anarkali suits, ladies anarkali suits, ladies salwar suits and masakali suits. We are exporting and manufacturing Ladies Suits that includes, heavy anarkali suits, ladies anarkali suits, ladies salwar suits, Anarkali Salwar Suits and masakali suits. Exporting and manufacturing Ladies Suits that includes, heavy anarkali suits, ladies anarkali suits, ladies salwar suits, Anarkali & Jodha Akbar Suits and masakali suits. We are exporting and manufacturing with trained and hardworking professionals, we are able to manufacture, supply, wholesale, trade and export a wide collection of Ladies Suits Dress Material Embroidered Semi Stitched Anarkali Suit. We are exporting and manufacturing Ladies Suits that includes, heavy anarkali suits, ladies anarkali suits, ladies salwar suits,Heavy Anarkali Suits and masakali suits. 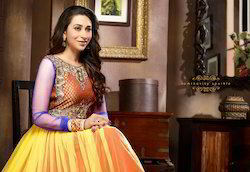 Exporting and manufacturing Ladies Suits that includes, heavy anarkali suits, ladies anarkali suits, ladies salwar suits,Ladies Anarkali Suits and masakali suits.